Sweet, moist, all-American brownies. All photography by Corey Lugg | THE NIBBLE. 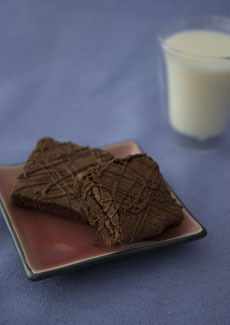 A cake-style brownie has a texture that is similar to cake; a fudge-style brownie has a very dense and moist texture, looking more like fudge. A fudge-style brownie is more buttery and thus much richer than a cake-style brownie. A moist brownie is like a moist piece of cake. It isn’t dry. A super moist brownie has so much butter in the recipe that it will be “wet” with butter—the butter will rub off on your fingers when you hold the brownie. Generally, a super moist brownie will be a denser, fudgy brownie style. There is a difference between sweet and rich. Sweet refers to how sugary the product is, richness comes from the fat in the butter (and any cream in the the frosting). Chocolatey refers to the intensity of the chocolate. Brownies made with a higher percentage of cocoa or chocolate ingredients are more chocolatey. Higher percentage refers to the percent of ingredients that are chocolate (3 ounces vs. 2-1/2 ounces in the recipe, for example), but can also refer to the percentage of the cacao used (an 85% cacao bittersweet chocolate versus a 60% semisweet chocolate, for example). In either of these examples, using the higher number amount would yield a more chocolatey brownie. 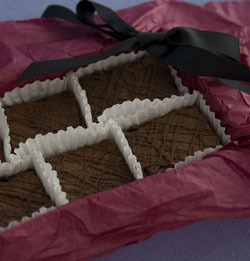 Now that you’ve learned brownie styles, let’s turn to the bar that started the business. Brownies are classified as a bar cookie (see the different types of cookie styles), as are lemon bars and Sugabetten’s other product.